Holiday greetings from six ho-ho-hometown celebrations! Unwrap the gift of a fun-filled holiday season with these wintery celebrations at area towns. No need to travel far—with everything from twinkling lights and trees to prancing dancers and elves—each local town is guaranteed to make spirits bright. These hometown treasures prove that holiday magic isn’t just for the North Pole! Celebrate the holidays at Phoenixville’s Annual Candlelight Holiday Tour, December 1st, 3 to 7 p.m. Tour the town’s gorgeous homes and churches bedecked with twinkling lights, Christmas trees and holiday adornments. Stop by Ellie’s Choice and Foresta’s Market downtown for tickets. The following week, make merry at the Phoenixville Christmas Parade, December 7th. This season introduces the Winter Wonderland Village, 5 to 9 p.m., for shopping for holiday gifts and grabbing pre-parade snacks. The parade starts at 7 p.m. from the 300 block of Bridge Street, followed by the Christmas tree lighting at Bridge and Main Streets. The highlight of the weekend is Phoenixville’s 15th Annual Firebird Festival, December 8th. The fun begins downtown at 3 p.m., with a pub crawl, local food and craft vendors, street performers and live music. At 8:15 p.m., the night is ablaze with the Burning of the Phoenix (a large wood figure of a phoenix) at Veteran’s Park. In the spirit of the New Year, the firebird symbolizes rebirth—and warms up the chilly December evening! Do you hear what I hear? The Theatre Organ Society of Delaware Valley brings us goodness and light with their annual Holiday Concert, December 9th. Enjoy an afternoon of holiday music favorites at The Colonial Theatre, 227 Bridge St. at 2 p.m.
More at Phoenixville.org, TOSDV.org, and FirebirdFestival.com. 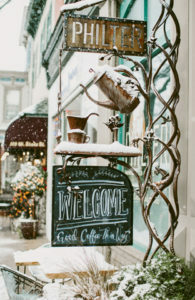 Holiday cheer lasts all season long in Kennett Square. First, the Holiday Village Market at The Creamery is a must for savvy shoppers. This open-air market offers food trucks, ice sculptures, seasonal craft workshops and more at 401 Birch St., 11 to 5 p.m., on December 1st, 2nd, 8th and 9th. 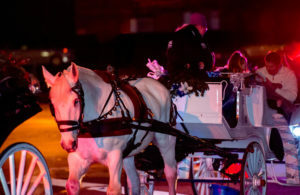 Stop by on a Sunday through December 23rd for horse-drawn carriage rides. Or catch a shuttle and jingle all the way to A Longwood Gardens Christmas, through January 6th. This year Longwood reimagines the Christmas tree like you’ve never seen it before—with suspended firs, “trees” made of stained glass, and more new twists. A half million lights dazzle as you stroll among outdoor fire pits, colorful fountains and carolers. Mush-room for fun, indeed! New Year’s Eve revelry is “capped” at midnight at Kennett Square’s Annual Mushroom Drop, starting 6 p.m. The whole family can enjoy live music and entertainment, laser light show and indoor festivities with The Garage Community and Youth Center. It’s only fitting that at midnight, the Mushroom Capital of the World drops an 8-foot-tall, stainless steel mushroom! More at HistoricKennettSquare.com, LongwoodGardens.com, MidnightInTheSquare.com. Enjoy the classic traditions of Christmas past, including horse-drawn carriage and trolley rides, at Christmas in Wayne, 5 to 8 p.m. on Friday, November 30th. Feast your eyes on magical holiday decorations at the open house and train display. Even Scrooges will love Christmas carolers, ornament decorating and face painting in town. That evening, Santa gives the reindeer a vacation! At 7:30 p.m., Saint Nick arrives on a cherry red firetruck for the Christmas Tree Lighting at the Wayne Train Station. Gather with friends and family as twinkling lights brighten the dark winter night. On Saturday, burn off holiday treats at the Elves for the Shelves 5K and Fun Run, December 1st at 8 a.m. Run—or walk—with Santa and his helpers. Take #Elfies for Instagram to show your holiday spirit. And in the spirit of giving, event proceeds go to Radnor Memorial Library. Check Elves for the Shelves 5K and Fun Run on Facebook for registration info. Later on Saturday, stroll over to Lancaster Avenue for the Santa Parade at 10 a.m., featuring music, cheerleaders and more. Follow Santa to the Wayne Hotel for hot chocolate, cookies and photos until 11:30. Celebrate like royalty at Christmas on King—King Street, that is—Saturday, December 1st from noon to 8 p.m. The family fun happens on Malvern’s main shopping street, King Street, and in Burke Park, at the intersection of Warren Ave. and Roberts Rd. Kids will love arts and crafts, plus cute and fuzzy farm animals at the Burke Park Petting Zoo. Free pony rides are available for little princes and princesses. And let’s face it, dogs are our kids too. Strike a pose with your well-dressed pup at the Canine Christmas Corner, noon to 4 p.m., and you could win a special drawing full of Christmas goodies for your doggie! Frosty ice sculptures are the perfect backdrop for family photos and Instagram pics. Watch the ice carver in action and keep an eye out for a stilt walker and wandering illusionist. Then, enjoy some adult holiday spirits at The Christmas Cheer Fest Cocktail Lounge next to Wolfe’s Baldwin Brass on King Street. Other festivities include a Santa Parade at 5 p.m. along King Street, the Snow Globe Ballet at 4 and 5 p.m. at the Malvern Buttery, plus trolley rides, tree lighting, food trucks and great shopping. The following week at Historic Sugartown outside Malvern, experience a Victorian holiday at A Sugartown Christmas, Saturday, December 8 from 11 to 3 p.m. Explore the historic village, festively decorated for the season. You can even try your hand at crafting Victorian ornaments and cards like they did in the ol’ days. 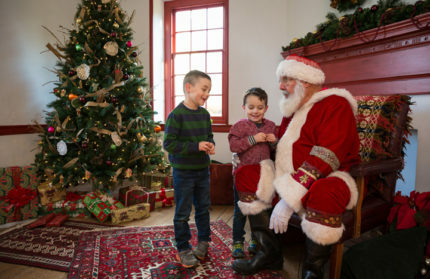 Take the kids to meet jolly Saint Nick in historic 1805 William Garrett House, and satisfy their sweet tooth by decorating holiday cookies and a gingerbread village. Admission is $7, free for 2 and younger. More at Malvern-Festivals.com and HistoricSugartown.org. 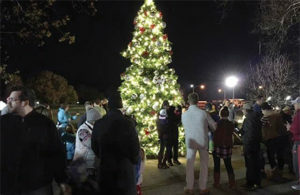 Experience your Hallmark moment at the Downingtown Christmas tree lighting in Log House Field, November 24 at 6 p.m. This year’s tree will be bigger and better than ever—20 feet tall crowned by a three-foot star! Warm up under holiday lights with cookies and hot chocolate, a s’mores station, music, face painting and small crafts for kids. Santa will visit around 6:30 p.m.
For more fun, join the crowds along the sidewalks for the Downingtown Good Neighbor Christmas Parade on Route 30, December 8 at 3 p.m. This free and fun family event has floats, music, dancers, Santa and more. Downingtown businesses get festive by competing in the Storefront Decorating Contest, where shop windows turn into winter wonderlands. Stroll down bedecked streets and vote for your seasonal favorites through December 8th. Are visions of sugar plums dancing in your head? Time for not one, but two productions of The Nutcracker in Wilmington this month. On December 8th and 9th, join 100+ dancers from the Wilmington Ballet at the Playhouse in Rodney Square. Later this month, revisit the magic with the First State Ballet, December 21st through 23rd, at The Grand Opera House. Santa Claus is coming to town—on a train, that is. Meet Saint Nick on the Santa Claus Express with the Wilmington and Western Railroad. Have the kids pose for pics with Santa during this hour-and-a-half round-trip to Ashland. Trains depart Saturdays and Sundays from Greenbank Station, 2201 Newport Gap Pike. All aboard! More at TheGrandWilmington.org and WWRR.com. Brandywine Ballet. Dec. 7–16, Emilie K. Asplundh Concert Hall, 700 S. High St., West Chester. Visit website for times. $25–$45. BrandywineBallet.org. The Pennsylvania Ballet. Dec. 7–31, Academy of Music, 240 S. Broad St., Philadelphia. $45–$159. PaBallet.org.